Life support is a new campaign by Mind charity. The campaign is all about the support people with mental health problems need in their homes and communities to stay well and live a full life. The campaign calls for you to share your experiences of ‘life support’ services and what these services mean to you. Last week, you sent National Mind hundreds of stories about how ‘life support’ services have helped you. Today, we want to make sure your stories are heard far and wide. ‘Life support’ services make a huge difference to so many lives, so let’s shout about this from the rooftops! We will be joining National Mind in spreading the word on Facebook and Twitter to celebrate these services. Will you? It’s great to see so many people sharing their stories about ‘life support’ services. Stories include how ‘life support’ services help to make your day-to-day lives better and how devastating it could be if these services were taken away. These services are invaluable – but they are also undervalued, underfunded and under threat. Join us and National Mind in celebrating these services and highlighting their value. 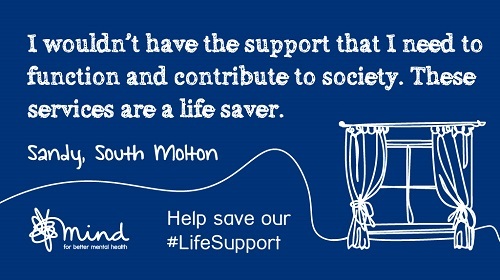 Share your story today using #LifeSupport and help us save these invaluable services.